Sound Transit is beginning property acquisitions for the East Link alignment in the South Surrey Downs neighborhood. The Carriage Hill and Carriage Place condos will be the first to be acquired, followed by the remaining 112 properties in the area. The Seattle DOT has released a draft of the 2013 Seattle Bicycle Plan. The plan’s purpose is to move toward a rethinking of how Seattle can accommodate bicyclists. Bicycle trips should be safe, convenient, and a pleasant travel choice for many residents, including people of all ages and abilities. The open house on transportation funding, which was previously scheduled for June 6 at Bellevue City Hall, will now take place June 19. The open house and comment period will take place from 5:30 – 6:30pm, followed by the moderated town hall from 6:30 – 8pm. Read about how the Washington, DC neighborhood of NoMa (short for North of Massachusetts Ave) developed into a thriving area after the city placed a Metro station there. The neighborhood is lauded as the poster child for transit-oriented development. A new study on commuting habits found that people who walk or bike to work might be putting peer pressure on others to follow suit; those with a spouse or coworker who actively travel to work are more likely to do so themselves. Deputies in Orlando trying to protect pedestrians issued 36 citations to drivers in one hour after going undercover as tourists. In Central Florida, two pedestrians are injured every day. Most of the tickets issued were for failure to yield to a pedestrian. 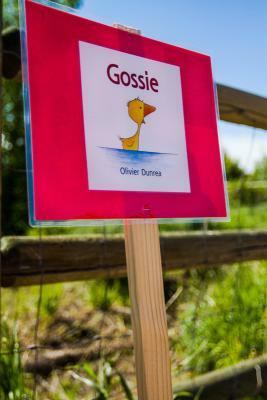 A new program in Utah allows to take their children on Storywalks. Pages of a children’s picture book are taken apart and mounted on laminated stakes about 40 paces apart from one another. Need another reason to fit in an after lunch walk or a stroll after dinner? Walking 15 minutes after eating can lower blood sugar and the risk of type two diabetes. The study, released on Wednesday, also found that this approach is more effective than a 45 minute walk in the morning or afternoon. “ITE Recommended Practices on Accommodating Pedestrians and Bicyclists at Interchanges,” a free webinar, will take place on Tuesday, June 25 from 11:00am -12:30pm. The webinar will focus on the recommendations from the draft, Recommeded Practice, which will soon be released by the Institute of Transportation Engineers. A recent study in Montgomery County, Maryland, found that pedestrians are cited 5 times more than drivers in areas where pedestrian collisions are high. Of the 2001 citations issued this year, 1,850 were given to pedestrians, 90 to drivers, and 60 for undetermined cause. Recent legislation in Washington, DC would provide district students with free transit passes. By 2020, London hopes to have a 20 mph speed limit on all residential streets in the city. Currently, this speed limit is only in place on 19 percent of the roads, but a task force is working to make the streets safer for pedestrians and improve the quality of life for all residents. Activists in Bogota, Columbia are calling for more pedestrian safety after 296 pedestrians died on the city’s streets last year. A Dutch designer has an interesting approach to urban furniture by making use of trash cans, fire hydrants, and other common sidewalk features.